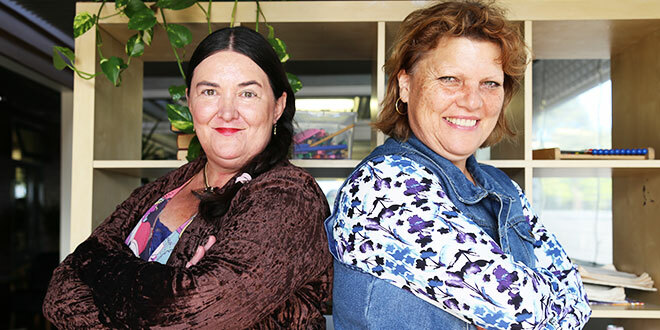 Proud graduates: Jane Sullivan and Gordana Stanojevic, both diagnosed with schizophrenia, graduated with a Certificate of Liberal Studies from Australian Catholic University’s Clemente program this month. MENTAL illness left Jane Sullivan in isolation for nearly a decade until a Catholic university education program helped her find her voice. Ten years ago, Ms Sullivan was diagnosed with schizophrenia, a serious mental illness that made her extremely tired and unable to commit to long-term activities including work and study. “All up until that time period of being 38, I’d struggled with jobs, courses and didn’t know why I wasn’t achieving things,” she said. Her diagnosis drove her into social isolation where she became reserved and anxious in unknown situations. A groundbreaking education program run by Australian Catholic University changed her life. Known as Clemente Australia, the program offers university-level education for Australians with multiple disadvantages or in social isolation. Students in the Clemente program are graded on the same level as their campus counterparts and are given no advantages other than subsidised study from ACU. Students who successfully complete four units of study receive a Certificate in Liberal Studies. The program was the first time since Ms Sullivan’s diagnosis that she could maintain a long-term focus on any task. “When I first came here, I didn’t have a voice, not because people had made me like that but I had lost my voice through the mental illness,” Ms Sullivan said. Over the past four years, she has studied units on Sculpture, English Literature, and then Ethics and finally Indigenous Studies, writing university-level essays for each. She said the friendliness and welcoming nature of the university staff, volunteers known as “learning partners” and co-operatives from charities including the St Vincent de Paul Society and Centacare kept her to returning each week. “And as every week went on, my confidence just grew,” Ms Sullivan said. She was officially awarded with a completion certificate last week, and is now enrolled to study a Bachelor of Counselling part-time next semester. “I wasn’t sure I could do university before this, because of my past, not being able to complete courses because of the illness undiagnosed … but knowing that I can do that now, I feel really confident,” she said. Fellow student Gordana Stanojevic, also diagnosed with schizophrenia, completed the course with Ms Sullivan, finishing her university studies with two distinctions and two high distinctions. Ms Stanojevic said the program gave her a chance to develop goals in her life. “I just needed to build up more self-confidence as I was quite shy, and not knowing how to start up conversations with other people,” she said. Ms Stanojevic is considering studying a Bachelor of Visual Arts in the future. ACU vice-chancellor Professor Jim Nyland said at the Clemente program graduation the course was “more transformative than any other programs I have seen”. Prof Nyland said the opportunity to receive an education would change the students’ lives. “You’re not given any advantage at all,” he said. “You will be judged by the university staff like any other student, so the marks that you’re getting and the units you’re completing are simply outstanding. “So I’m very proud of this program, I’m very proud of you.